Here’s what’s up in the world of TV for Monday, November 16. All times are Eastern. 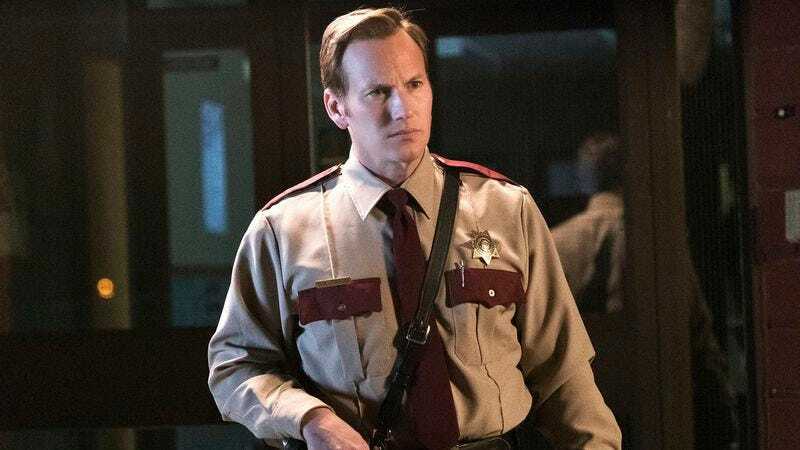 Fargo (FX, 10 p.m.): You probably haven’t heard of this Fargo show—it’s on a small network and no one ever talks about it—but we figured we’d throw it a bone this week. After all, every episode this season—this is actually the show’s second season, but you also probably didn’t know that—has gotten an A grade. Well, besides episode three, which is a black mark on the entire season with an A- grade. In the Noah Hawley-penned “Rhinoceros,” “Lou and Hank try to prevent an altercation, Peggy and Ed defend their choices and the Gerhardt clan attempts to get back one of their own.” We understand that this only means so much, since most of you haven’t even heard of the show before. Zack Handlen is actually a little upset this is the Top pick: He wanted to keep Fargo super underground for the rest of its days. In fact, his exact words to us were “Fargo f*#&$ yourself.” Get it? Crazy Ex-Girlfriend (The CW, 8 p.m.): It’s a Thanksgiving episode in West Covina, and if you still call Crazy Ex-Girlfriend to a more honest (yet obviously more cartoonish) version of Felicity, then you know things are going down. “Rebecca scores an invite to the Chan family Thanksgiving festivities, where Josh’s parents fall in love with her much to Valencia’s dismay.” Holy crap. There are people who don’t love Valencia. Like we said: Things are going down, and Allison Shoemaker is ready to witness it all. Gotham (Fox, 8 p.m.): This week’s Gotham synopsis—for the episode “Rise of the Villains: A Bitter Pill to Swallow”—is the one to finally mention Detective Gordon, and so ends our fun times. In fact, he’s sort of the focus of this synopsis: “Gordon and Barnes continue cleaning up Gotham, and Gordon comes face-to-face with one of the city’s most dangerous hitmen, Eduardo Flamingo (guest star Raul Castillo).” Kyle Fowle called last week’s episode “fun,” which is literally the only hurdle the show needs to clear when Scott Von Doviak fills in for this week’s review. Blindspot (NBC, 10 pm. ): In this week’s episode (titled “Authentic Flirt”), “Jane and Weller go undercover as a world-class assassin couple to prevent deadly information from getting into the wrong hands. The intimate assignment draws them closer than ever.” Usually we’d keep it to ourselves, but we just can’t this week: Oh, brother. From both us and Liz Lemon. Joshua Alston is willing to give the show the benefit of the doubt, but he’s also willing to forgive the show if it immediately stops with the Jane/Weller “thing” and pretend like it never existed. This Monday actually marks the beginning of Adventure Time’s mini-series, Adventure Time: Stakes, and with that comes Oliver Sava’s pre-air review of said mini-series. If you’re not into animation but into… other things, there’s also Alex McCown’s pre-air review of The Man In The High Castle, a show that is pretty much the exact opposite of Adventure Time. Because of all the Nazi stuff. The Voice (NBC, 8 p.m.): Live Top 12 performances, here we come. This is The Voice, etc. Vanderpump Rules (Bravo, 7:30 / 9 p.m.): Here’s how TV Guide describes this week’s Vanderpump Rules, “Social”: “An episode featuring social-media content.” There it is—an episode of television. Scorpion (CBS, 9 p.m.): In “US vs. UN vs. UK,” the geniuses of “Team Scorpion [are] blackmailed to break into the United Nations to assist in the assassination of a menacing arms dealer.” Smooth move, Ferguson. Minority Report (Fox, 9 p.m.): “Blake’s suspicion of Vega and Dash intensifies.” Well, okay. It wasn’t that high before, so any amount of suspicion technically counts as intensifying, you know? Meanwhile, in the actual A-plot, “Dash and Vega follow a vision to the Southside, encountering distrust from the community.” Minority Report? More like Vague Report. Minority Report! NCIS: Los Angeles (CBS, 9:59 p.m.): All we know that it’s not the episode it was originally supposed to be. Castle (ABC, 10 p.m.): Oh hey, Castle and Beckett are celebrating their one-year wedding anniversary. That’s supposedly cause for celebration, right? Hope they don’t have “to hunt down the brutal murderer of a grifting seducer.” Whoops. Après Ski (Bravo, 10 p.m.): “A fiery group dinner splinters the group.” Please let there be wine throwing and table flipping. Please let there be wine throwing and table flipping. Please let there be wine throwing and table flipping. Follow The Rules (MTV, 10 / 10:30 p.m.): In this two-shot of MURDA, “the grannies have a pie-making competition” and “Ja tries to fix Brittney’s bathroom.” Honestly, this pairs perfectly with tonight’s new episode of True Life (keep reading to see why). Legends (TNT, 10 p.m.): “It’s a race against time as Martin searches for Kate in Paris. He’s convinced the peaceful protest she’s attending may turn violent at the hands of her friend Ifti, a boy with radical beliefs. In 2001 Prague, Dmitry discovers that the key to getting to Doku Zakayev (Visar Vishka) may not be his brother Tamir (Nikola Djuricko), but instead Doku’s wife, Ilyana. In 1991 Lithuania, a younger Ballard is involved in an incident that will affect the rest of his life.” Who needs an episode of Legends when you have a Legends episode synopsis, huh? Gigi Does It (IFC, 10:30 p.m.): “Love Thyself.” That’s what the first season finale of Gigi Does It says to do. So how will Gigi do it? “Gigi decides it’s time for some male companionship, so she and Ricky sign up for a speed-dating event.” Yes, that sounds about right. Super Into (truTV, 10:30 p.m.): So, what won’t we believe that Margaret Cho is super into? Marijuana! “Included: a ‘pot limo’; and dinner with a 420 chef.” We’re still not surprised by these hobbies, Super Into. Try again next week. Watch What Happens: Live (Bravo, 11 p.m.): Drew Barrymore won’t share Andy Cohen with anyone! Anyone! Or maybe she’s actually sparing another party from having to watch what happens (live!) with Andy Cohen. Villain? Hero? Which one is it, Drew? True Life (MTV, 11 p.m.): In True Life: Hip Hop Hustlers, the show chronicles “the experiences of up-and-coming hip-hop artists whose parents are their managers.” How Jamie Kennedy has not tried to make a movie out of that, we’ll never know. X-Men (HBO, 5:15 p.m.): Say, have you heard the news? Comic book movies are allowed to be decent now. Also, do you know what happens to a toad when it’s struck by lightning? The answer may surprise you. Charming Christmas (Hallmark Channel, 10 p.m.): If you want to get in the Christmas spirit before Thanksgiving even comes, then check out this Hallmark Channel original movie. It stars Darla from Buffy The Vampire Slayer and Christopher from Gilmore Girls, so you know it pings someone’s WB fan fic dreams. As for the actual plot: “A businesswoman plays Mrs. Claus at her family’s department store and her life begins to change: She rekindles her love for Christmas, and she begins a possible romance with the store’s charismatic Santa Claus.” Yep, definitely some pinging. The Walking Dead: You guys like Daryl, right?